The game of golf has been a South Carolina Lowcountry tradition since Scottish immigrants to the city of Charleston organized America’s first golf club in 1786. From the day the first course was born on Hilton Head in 1961 to today, the island golf community has always valued quality over quantity – a belief that has earned Hilton Head the reputation as “the Golf Island.” Hilton Head truly began its journey to a treasured golf destination with the 1969 opening of Harbour Town Golf Links – host course to the PGA Tour Heritage Golf Classic for more than three decades. Our golf travel guide is one of the most comprehensive guides to everything you need to know about “The Golf Island”. In addition to detailed information about many of the Island’s top golf courses, our Golfers Guide includes access to outstanding deals on all inclusive and golf only packages, a detailed golfer’s map that will help you navigate the Island’s thirty plus square miles of beautiful coastlines, historic plantations, and some of the best golf courses you will find anywhere. If you would like to get pricing for your upcoming golf trip to the Golf Island please contact our golf staff at 888-479-4301. GOLF GUIDE Along with a brief description of many of Hilton Head’s finest championship courses, our course guide offers you a detailed look at what makes each of the courses unique. From detailed yardage, Slope and PGA Ratings, to photos, our course guide will give you an inside look at each and every course. Hilton Head combines a wealth of more than 20 golf courses fashioned by the games most well know architects such as Arnold Palmer, Arthur Hills, Robert Trent Jones Sr., Pete Dye and Jack Nicklaus, with the charms of the region itself. It strives for quality versus quantity and it shows. Hilton Head’s golf courses were named one of the ten best golf resort in the world by Golf Digest. This combination of diverse architect styles provides the golfer with just about every flavor of golf one could want. To get more information about Hilton Head’s top golf courses just click on the Course link above. PACKAGE GUIDE By partnering with some of Hilton Head’s top golf courses and resorts we have access to dozens of outstanding packages designed to entertain and challenge each and every golfer no matter what their experience level. Golf is still an individual sport and sometimes golfers want a package that is designed specifically for them. To check out this month’s package specials or to design your own package just click on our Golf Packages link. LODGING GUIDEThe Hilton Head area is unique when it comes to lodging for the thousands of golfers that visit the Golf Island each year. Hilton Head offers a wide variety of lodging options from; beach front hotels and resorts, to outstanding golf course villas, where your next round can be as close as your back yard. No matter what you are looking for Hilton Head has the ideal lodging facility for you and your group. If your primary reason for being in Myrtle Beach is golf then plan ahead and ask your golf travel guide to book your lodging so that getting to and from your courses does not become a driving nightmare. Although Hilton Head is only twelve miles long by five miles wide getting around the island especially during the peak tourist season can present some serious driving problems if you don’t plan ahead. To get more information about the lodging options available to you and your group use our Lodging Guide link. TRAVEL GUIDE When you’re ready to take a break from the golf course, you’ll discover that there are many more fun things to do on Hilton Head Island than chasing a golf ball around. Many of the restaurants and pubs have live entertainment, and some will invite you to come up on the stage to share your singing ability. If you still have the energy to do something more physical you might consider a bike ride on the miles and miles of bike trails on the island, most of the resort offer rentals. If fishing is your second sport then you might contact one of the local charter services and take a shot at landing a big one. No matter what your interest, Hilton Head has something for everyone, be sure to work with your packager to take advantage of all that the area has to offer. The following list represents some of Hilton Head’s most exciting places to occupy your time after your rounds are over. HILTON HEAD WEATHER Hilton Head Island’s weather is ideal for those wanting to explore the outdoors and soak up the sunshine. 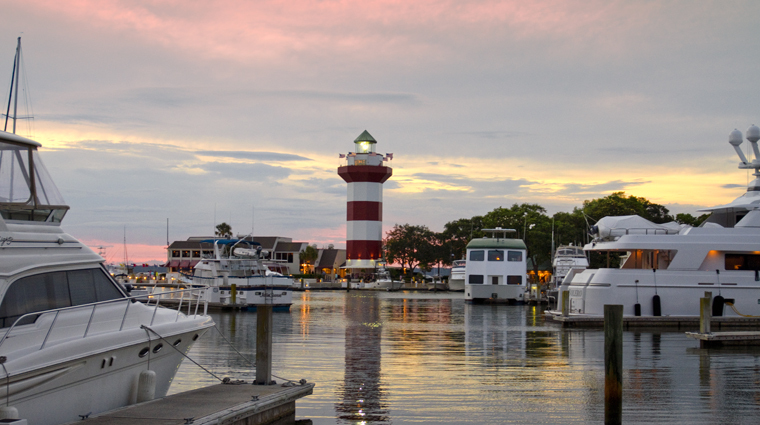 The Hilton Head area features a balmy, subtropical climate year round. AIR TRAVEL Two airports service the Hilton Head Island area: Hilton Head Airport, located approximately 5 miles (8 km) from all Island resorts, and Savannah/Hilton Head International Airport, located approximately 45 miles (72 km) south of the Island. HILTON HEAD ISLAND AIRPORT (Airport Identifier: HXD Located on the north end of the Island, Delta Express from Atlanta and US Airways Express from Charlotte offers daily flights to the Hilton Head Airport. Enjoy all the luxuries of a “big city” airport without the hassles – no traffic jams when looking for a parking space, no mile-long hike from a parking garage to the terminal, and no long lines at the ticket counter. You won’t even need a compass to locate your gate. We have a beautiful full-service terminal building in a great location. We’re centrally located mid-island just 15 minutes from everything you came to Hilton Head to enjoy – Harbour Town, the ocean, golf, tennis, fine dining and excellent shopping are all just around the corner. Why waste your valuable time doing anything else? SAVANNAH/HILTON HEAD INTERNATIONAL AIRPORT (Airport Identifier: SAV) The nearest international airport is the Savannah/Hilton Head Island International Airport, located 45 minutes from the Island. Currently there are five airlines servicing eleven cities that now offer non-stop service to Savannah/Hilton Head International. With many of the major airlines now offering connecting flights in and out of Savannah you can get connecting flight from virtually anywhere east of the Rockies. Savannah/Hilton Head International Airport Shuttle is now offering shuttle service to/from the Savannah/Hilton Head International Airport in Savannah, Georgia to 6 different stops in Hilton Head Island, SC and 2 stops in Bluffton, SC. DRIVING DIRECTION If flying is not an options, and you are planning to drive to Hilton Head, then we have some helpful links to get you here. We have put together driving direction from some major cities to help you get started. Click on the city of your choice and our Google map will provide you with a map and driving directions. Even if you are not driving from one of these cities you can use either of these links to get direction from virtually city. Begin by clicking on any of the Cities.